The award-winning playwright Arthur Miller and his actress wife Marilyn Monroe can breath a collective sigh of relief today. After a two-year legal battle to clear his name, Washington's Court of Appeals has finally quashed his conviction for contempt of Congress. In May last year, a judge convicted Mr Miller for refusing to tell the House Un-American Activities Committee (HUAC) the names of alleged Communist writers with whom he attended five or six meetings in New York in 1947. He had been questioned by the HUAC in 1956 over a supposed Communist conspiracy to misuse American passports and willingly answered all questions about himself. But he refused to name names on a point of principle saying: "I could not use the name of another person and bring trouble on him." Today his lawyer, Joseph Rauh, argued that the committee simply wanted to expose the playwright and that "exposure for exposure's sake" was illegal. Mr Rauh added that the timing of the hearing - just before his marriage to Marilyn Monroe - would ensure maximum publicity and humiliation for the writer. He also said the questions he would not answer were not relevant to the passports issue. However the appeal court ignored this argument finding instead that the way the questions were put to Mr Miller by the HUAC made contempt charges untenable. Mr Miller had asked the committee not to ask him to name names and the chairman had agreed to defer the question. So the court today ruled that at the time Mr Miller was led to believe this line of questioning had been suspended or even abandoned altogether. The House Un-American Activities Committee (HUAC) was set up in 1938 to investigate fascists as well as communists within federal government. In 1947 it turned its attention to the arts and over the next three years managed to get several Hollywood writers and directors blacklisted for their political views. They included director Elia Kazan, who directed Arthur Miller's award-winning play Death of a Salesman in 1953. As more convictions of contempt were quashed by the courts of appeal, the committee's influence declined and it was abolished in 1975. 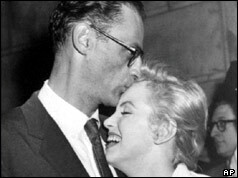 Arthur Miller later said his trial only went ahead because he had refused one of the members of the HUAC permission to be photographed with Marilyn Monroe. The couple divorced in 1961.